Speaker Azad Jammu and Kashmir (AJ&K), Shah Ghulam Qadir made a courtesy call on Deputy Chairman Senate, Saleem Mandviwalla at Parliament House on Friday. Issues of mutual interest, including security and environment were discussed. 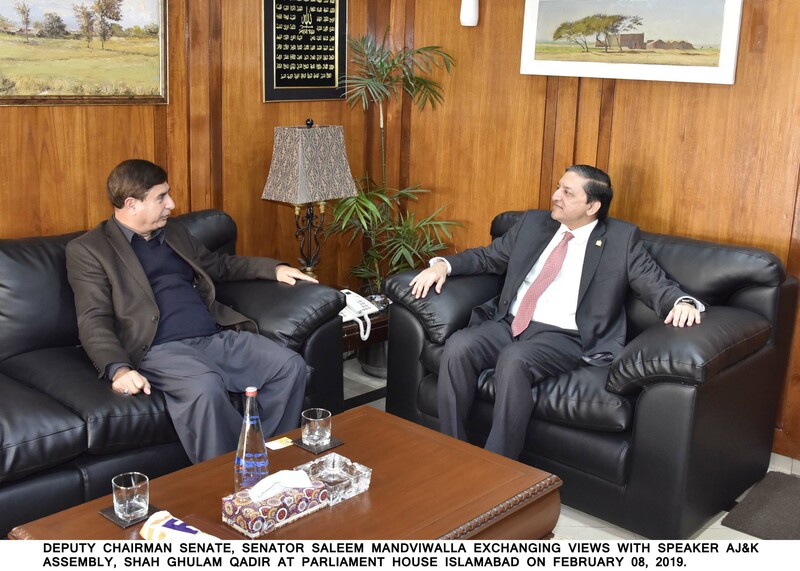 Deputy Chairman Senate, Saleem Mandviwala stressed the need to promote tourism of AJ&K and also asserted the need for proper waste management mechanism to protect the Kashmir’s natural beauty and its immaculate environment. Speaking about his recent visit to AJ&K, he conveyed the concerns and problems being faced by the people of Leepa Valley, Kashmir and said that a tunnel may be constructed with the help of any friendly country likewise Lowari Tunnel in order to get local people connected with other cities of AJ&K throughout the entire year. While discussing the issues regarding treatment of Pakistani tax filers in the territories of AJ&K, Speaker Shah Ghulam Qadir said that the AJ&K Government was in constant consultation with the Federal Board of Revenue (FBR) to integrate the systems and hopefully it would be integrated soon. Deputy Chairman Senate said that a meeting would be called with the FBR and relevant stakeholders and the matter would be taken up with them. He also stressed the need to enhance interaction between the two Parliaments and said that he would visit the AJ&K Assembly in near future.